Cargo traffic at major ports was 49.8mt (up 3% YoY). 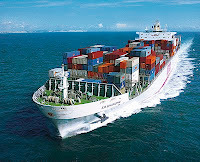 All-India cargo volume grew 11.2% MoM, the first double-digit MoM growth in FY11. YTD cargo volume growth has been muted at 0.8% (365mt) on account of vigorous monsoons. POL (petroleum, oil and lubricants), which contributed ~33.3% to all India cargo volume, witnessed 16% YoY volume growth during the month to 16.6mt. Container volume grew 17.2% YoY to 9.4mt. The growth in POL and container traffic set off the decline in iron-ore cargo. JNPT continued to witness double-digit growth in container cargo at 16.5% YoY to 4.97mt. All-India container traffic was up 17.2% YoY at 9.4mt. Container cargo was up 20% YoY to 2.2mt at Chennai, up 88% YoY at Kandla, and down 19.4% YoY at Kolkata. In November 2010, five ports posted traffic growth. At Kandla, cargo traffic was up 47.5% YoY, boosted by coal. At JNPT, cargo volume was up 15.8% YoY, boosted by container traffic. Our Report on Logistic Sector Coming Soon…….